The effect of weed on your short term memory has long been a standard in any cannabis-comedy routine. Now, researchers are unlocking the effect of cannabis on memory. A new study published in the British Journal of Psychiatry suggests that variations in the chemical makeup of different strains of marijuana are associated with different levels of cognitive impairment while high. 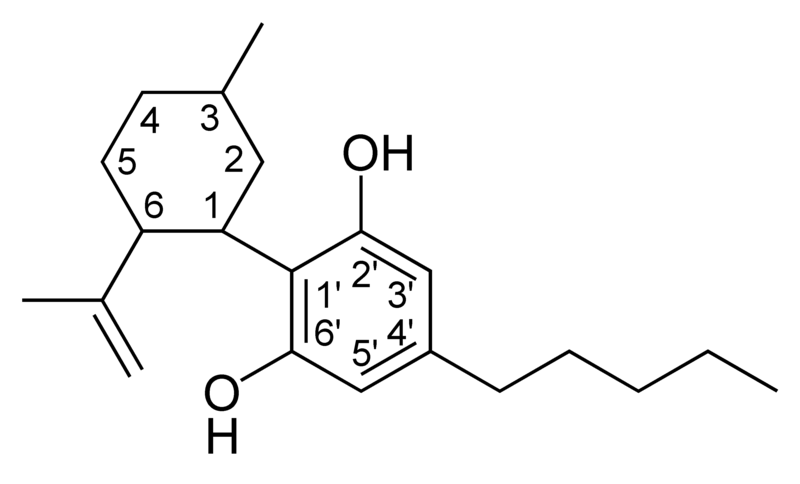 Tetrahydocannabinol (THC) is commonly recognized as the ingredient in marijuana that causes a “high” in users, but researchers have long known that pot contains other active substances as well. While THC can cause the widely advertised hallucinations and paranoia, another chemical found in marijuana, cannabidiol (CBD), is believed to be responsible for the calmer, sedating part of the experience. The two chemicals have opposing effects on one of the brain receptors affected by cannabis, the CB1 receptor. Some clinical studies have proposed that CBD acts as a balancing force to regulate the strength of the psychoactive agent THC. Marijuana with relatively high ratios of CBD:THC is less likely to induce anxiety than marijuana with low CBD:THC ratios. CBD is also believed to regulate the body’s metabolism of THC by inactivating cytochrome P450, an important class of enzymes that metabolize drugs. To determine the effect of different levels of CBD, researchers studied 134 cannabis-using volunteers while they smoked their own stash of marijuana, at home. They gave them various cognitive tests, either while stoned or abstinent. Then, they took samples of the pot back to the lab for testing. In the US, it seems that the word ‘Kush’ is about as meaningful as ‘Skunk’ is in the UK. That is, the two terms are applied to most indoor weed that’s sold for profit, and both names are used to suggest that the cannabis being sold is highly potent, rather than to indicate any particular genetic heritage. Before being adopted as the strain-name buzzwords of the moment, both “Skunk” and “Kush” were fairly strictly defined strains, with clear breeding or geographical origins. More worryingly, when the buzzwords of the youth or underground cultures seep into the mainstream, they get picked up by the hysterical MSM and turned into the latest scare story. No doubt, all of the forum’s British members will be aware of the garbage that’s written and broadcast about “Skunk” in Blightly – as if it’s some new, child-incinerating super-weed that just dropped out of the sky, rather than a fairly common, medium-to-high potency strain that’s been around for at least 30 years. What’s especially nauseating about this claim what it tacitly suggests. Most members of the current establishment (government and media) have personal experience of consuming cannabis, in their ‘experimental student days’ or whatever. The subtext of the “new, super-potent weed” claim is that, in hindsight, the harmless old ‘natural’ cannabis of their youth was actually fine after all (as was the hashish of the times, apparently, despite it being orders of magnitude more powerful than today, but that’s another story). No matter that thousands were deprived of their liberty due to the draconian laws covering old-timey, harmless ‘natural’ cannabis in the 60s and 70s, it turns out that version of the demon weed was fine and harmless. Mistakes were made. But this new “Skunk” weed … that really does live up to all the fantasies that were spread back then, about the stuff we now know to be harmless. As might be expected, US lawmakers have taken it to the next level. CHICAGO – U.S. Rep. Mark Kirk, Lake County Metropolitan Enforcement Group Director Larry Lindenman, Waukegan Police Chief Artis Yancey and representatives from Lake County Sheriff Mark Curran’s office today unveiled tougher penalties for a new type of “super-marijuana” hitting the northern suburbs. “Kush,” street slang for a strain of highly-potent marijuana, has a tretrahydrocannabinol (THC) content of at least 20 percent. According to the National Drug Intelligence Center, the THC average of seized marijuana was less than 10 percent in 2007. In the early 1990s, THC levels were less than 4 percent. The rise of Kush mirrors the increasing popularity of high-THC marijuana, which has become more accessible with the rise of hydroponics. Drug growers are able to strictly control light, temperature and humidity and can cross-breed to maximize THC content. It takes growers approximately four months from planting to harvest to produce the high-potency marijuana. Other types of Kush are known as Bubba, Paris, Bubble Gum, Sour and Orange Kush. Kirk’s legislation, the High-Potency Marijuana Sentencing Enhancement Act of 2009 (H.R. 2828), increases federal fines and sentences for the distribution of high-potency marijuana. It defines high-potency marijuana as marijuana with a THC content of 15 percent or more. The legislation targets drug trafficking only and not possession of marijuana. Under current law, unlawful distribution, possession with intent to distribute, manufacture, importation and exportation of marijuana under 50 kilograms or 1 to 49 plants carries a maximum fine of $250,000 for an individual, $1 million for a group and up to five years in prison. H.R. 2828 increases maximum fines to $1 million for an individual and $5 million for a group, with a maximum sentence of 25 years. If death or serious bodily injury occurs, sentencing would be 20 years to life in prison. A second offense after a drug felony conviction would result in a minimum fine of $2 million for an individual or $10 million for a group, with a maximum sentence of 35 years, or life if death or serious bodily injury resulted from the use of the marijuana. And what a coincidence, that as medicinal cannabis laws are sweeping the USA (13 states and counting), the cannabis most valued for medicine – potent, well-grown sinsemilla – is being defined as an even harder drug than before. Medical marijuana may protect against swine flu! As schools return from their summer breaks, there is widespread concern amongst parents and teachers alike. Swine Flu (H1N1) thrives off the conditions typical in classrooms and younger demographics are particularly vulnerable. As manufacturers struggle to meet unprecedented demand, one company has a controversial idea.